Global recorded music sales grew by 9.7% in 2018, to $19.1 billion, the fourth consecutive year of growth after many years of decline. The results were driven by a surge in paid streaming, which rose by 33% last year, according to a new report by the International Federation of the Phonographic Industry (IFPI). 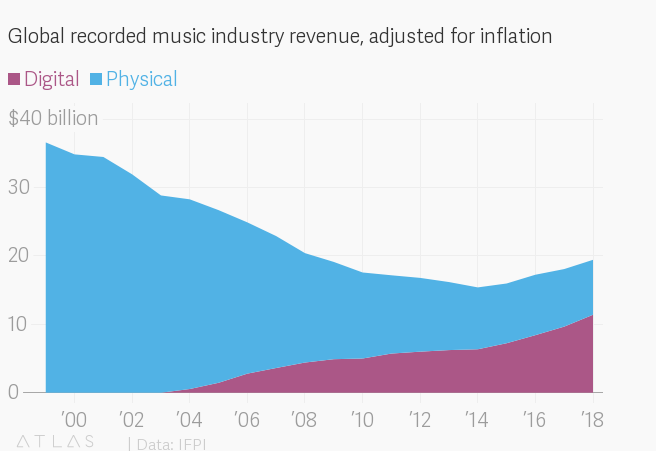 There are now 255 million paid music subscribers, accounting for 37% of total industry revenue. When ad-supported services are added, streaming now accounts for 47% of sales of recorded music. The fact that the music industry has thrown its weight behind streaming is noteworthy when you consider that not long ago, it fought against digital formats. At one stage, it even created a smartphone game called Music Inc, where you manage a band, a task that proves futile time and again due to the costs of online piracy. 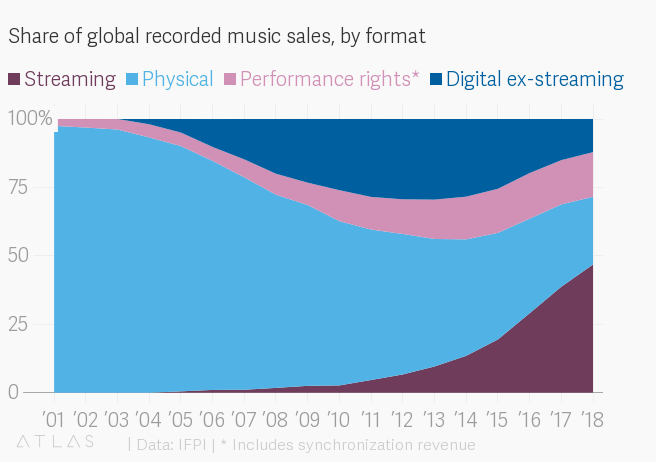 But the inevitable shift to digital music left major record labels without many other good options. Spotify and other streaming services have helped keep (paywall) the days of Napster piracy at bay, even if it also means the end of an era of big profit margins.